Where do new ideas and directions of thought come from? Is it possible to set a context for important changes in intellectual culture, in the sciences or the humanities? Can we give any explanation for the development of individual thinkers’ thought? These are the key questions that Neil Gross raises in his sociological biography of Richard Rorty in Richard Rorty: The Making of an American Philosopher (2009). The book is excellent in every respect. Gross has gone into thorough detail in discovering and incorporating correspondence with family and friends that allow him to reconstruct the micro setting within which the young Rorty took shape. His exposition of the complex philosophical debates that set the stage for academic philosophy in the United States from the 1950s to the 1980s is effortless and accurate. And he offers a very coherent interpretation of many of Rorty’s most important ideas. Any one of these achievements is noteworthy; together they are exceptional. Gross is not interested in writing a traditional intellectual biography. Rather, he wants to advance the emerging field of “new sociology of ideas” through an extended case study of the development of a particularly important philosopher. The purpose of the book is to provide a careful and sociologically rich account of the ways in which a humanities discipline (philosophy) developed, through a crucial period (the 1940s through the 1980s). The goal is to provide a sociological interpretation of the development of thinkers and disciplines within the humanities (in deliberate analogy to current studies in the sociology of science). Gross acknowledges but rejects earlier efforts at sociology of knowledge (Marx, Mannheim), as being reductionist to the thinker’s location within a set of social structures. Gross is more sympathetic to more recent contributions, including especially the theories of Bourdieu (field) (Homo Academicus ) and Randall Collins (interaction ritual chains) (The Sociology of Philosophies: A Global Theory of Intellectual Change ). These theories emphasize the incentives and advantages that lead strategically minded professionals in one direction or another within a discipline or field. But Gross argues that these theories too are insufficiently granular and don’t provide a basis for accounting for the choices made by particular intellectuals. To fill this gap he wants to offer a sociology of ideas that brings agency back in. He introduces the idea of the role of the individual’s “self-concept”, which turns out to be a basis for the choices the young intellectual makes within the context of the strategy-setting realities of the field. A self-concept is a set of values, purposes, and conceptions that the individual has acquired through a variety of social structures, and that continues to evolve through life. Gross emphasizes the narrative character of a self-conception: it is expressed and embodied through the stories the individual tells him/herself and others about the development of his/her life. And Gross thinks that these stories are deeply influential, in terms of the choices that a developing intellectual makes at each stage of life. In particular, he thinks that the academic’s choices are often inflected by his/her self-conception to an extent that may override the strategic and prudential considerations that are highlighted by Bourdieu and Collins. Bourdieu and Collins offer “no attempt to think through how the quest for status and upward mobility in an intellectual field may intersect and sometimes compete with thinkers’ cognitive and affective interests in remaining true to narratives of intellectual selfhood that have become more or less stable features of their existence” (562). In his view, identity trumps interest–at least sometimes. Or in other words, Rorty’s early career is well explained by the Bourdieu-Collins theory, whereas his later shift towards pragmatism and more heterodox, pluralistic philosophy is explained by his self-concept. In Gross’s telling of the story, much of Richard Rorty’s self-concept was set by the influences of his remarkable parents in childhood and adolescence, James Rorty and Winifred Raushenbush. The parents were politically engaged literary and political intellectuals, and they created an environment of social and intellectual engagement that set aspects of Richard’s self-concept that influenced several key choices in his life. Gross’s depiction of the social and intellectual commitments of James and Winifred, and the elite milieu in which they circulated, is detailed and striking. This “social capital” served Richard well in his course from the University of Chicago to Yale into his academic career. 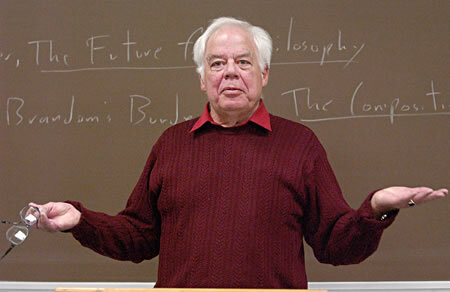 Gross believes that the key turns in Rorty’s development were these: first, the decision to do a masters thesis on Whitehead at Chicago; then his choice of Yale as a doctoral institution, with a Ph.D. dissertation on “The Concept of Potentiality” (a metaphysical subject); his shift towards analytic philosophy during his first several years of teaching at Wellesley; his deepening engagement with analytic philosophy in the early years at Princeton; his eventual critique of analytic philosophy in Philosophy and the Mirror of Nature ; and his further alienation from analytic philosophy in the years that followed towards a contemporary pragmatism and a more pluralistic view of the domain of philosophical methods. In other words, he began in an environment where pragmatism and substantive metaphysics were valued; he shifted to the more highly valued field of analytic philosophy during the years in which he was building his career and approaching tenure; and he returned to a more pluralistic view of philosophy in the years when his career was well established. The book repays a close reading, in that it sheds a lot of light on a key period in the development of American philosophy and it provides a cogent sociological theory of the factors that influenced this development. It is really a remarkable book. It would be fascinating to see similar accounts of innovative thinkers such as Nelson Goodman, John Rawls, or (from literary studies) Stephen Greenblatt. That’s not likely to happen, however, so this book will probably remain a singular illustration of a powerful theory of the sociology of ideas. « Structural adjustment for the middle class?